Luxury Vinyl Tiles are different from Standard Vinyl Tiles in that they can more accurately mimic the look of natural materials, such as Stone or Wood, to give a high-end, authentic finishes. Luxury Vinyl Tiles achieve this by featuring a surface layer with a realistic photograph, combined with texture, to give the effective impression of a real materials. This surface layer is then coated with PVC, to protect the Luxury Vinyl Tiles from everyday wear and tear. What would you choose Luxury Vinyl Tile Flooring? Design: Unless under an expert’s eye, it’s extremely difficult to notice the difference between Luxury Vinyl Tile Flooring and Hardwood or Tiled Flooring. The design, texture and finish of Luxury Vinyl Tile Flooring, is to an astonishingly high level, to bring eye-catching flooring to your home. Furthermore, Luxury Vinyl Tile Flooring opens up opportunities in terms of design. 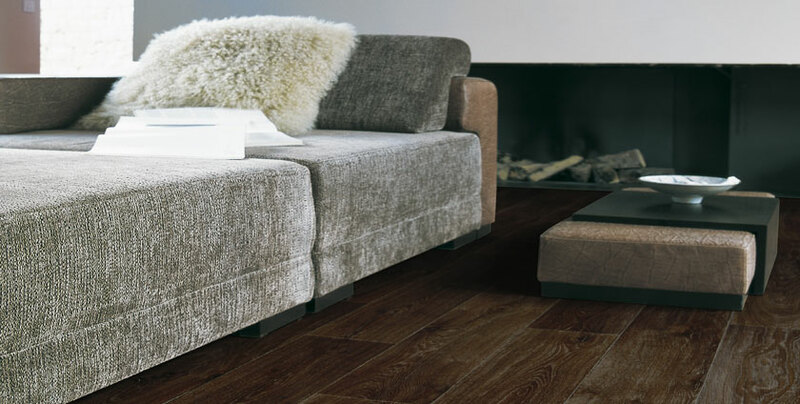 From the distressed Hardwood Plank look, to the textured Stone Tile Finish, you have a variety of designs to choose from at Karpet Kingdom and we can tailor any designs to suit your taste. On top of this, Luxury Vinyl Tile Flooring is quick and easy to install! Practicality: Whilst Luxury Vinyl Tiles look aesthetically stunning, they are also more durable than real wood, stone or ceramic tiles. Luxury Vinyl Tiles can withstand the general wear and tear of daily life, making them ideal for the family home and particularly rooms where there are high chances of spillages or water exposure, such as the bathroom and kitchen. Comfort: Luxury Vinyl Tiles are a lot warmer for your feet, than real wood or stone and can be used with underfloor heating systems – making Luxury Vinyl Tiles ideal for those winter months, that seem to be getting longer in the UK! Luxury Vinyl Tiles have taken the flooring market by storm and it’s easy to see why! With Luxury Vinyl Tiles, there’s endless possibilities and at Karpet Kingdom we can provide the perfect Luxury Vinyl Tile Flooring to suit any home and any budget.